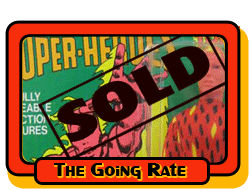 This auction is for the Mego figure in the pics. The figure is in nice condition with minor (if that) wear. Overall the figure is displayable. A neat Mego figure. As there are some buyers who incorrectly expect a mint item when they get it, I try to give a conservative view of what condition I think the item is in. However, you are the ultimate judge so you need to view the pics CAREFULLY and ask questions PRIOR TO BIDDING. A Mego Riddler figure with the box. The figure is in great shape with just a little seam split on the left leg of the outfit, which was repaired by the previous owner and a small dot on the right leg of the outfit, which might come out if washed. Riddler comes with the original belt and no paint loss to his head. The box is in great shape with the original window,, insert and a nice yellow color. The tab in the back is unpunched however the hole was punched out. The previous owner took tape and reinforced the inside of the top flap. The box does have some creases but makes a great display piece. A nice addition to anyone's Batman, Mego or action figure collection. Shipping is free in the United States. Pose him in any action position. The box has wear and there is a stain on the bottom flap. Both sides are bent in. Mego World's Greatest Heroes RIDDLER 8" FIGURE - CASE FRESH! MINT IN BOX! This boxed figure was obtained from a case of MEGO figures. RIDDLER is pristine, never removed from the box. He is TYPE 1- metal joints. BOX AND FIGURE ARE BOTH 100% ORIGINAL MEGO PIECES. This piece is in great condition and you won't find once nicer! A real gem! See photos. Item is sold as is. 8" tall / Really good condition overall. Very clean and barely played with. See pic for more details - EMAIL WITH ANY QUESTIONS. Check out my other items for more MEGO. Riddler has all original parts and is in MINT condition! No flaws visible. Box is in mint condition as well. YOU ARE LOOKING AT A MEGO WORLD'S GREATEST SUPER-HEROES 1976 RIDDLER MOC. THE CARD IS IN C-5 CONDITION. THE CARD HAS A TEAR FROM BEING RESEALED. THE TEAR IS CLEARLY VISIBLE BEHIND THE RIDDLER. THE BUBBLE IS NICE CONDITION BUT HAS BEEN REGLUED TO THE CARD. THE FIGURE IS OF COURSE RESEALED IN THE PACKAGE IN MINT CONDITION. THIS IS A RESEALED EXAMPLE OF THIS HARDER-TO-GET FIGURE ON THE CARD. THIS IS ONE OF THE HARDER TO GET MEGO CARDED FIGURES AND DISPLAYS NICELY FOR A FRACTION OF THE USUAL PRICE A MINT EXAMPLE WOULD GO FOR. YOU CAN ADD THIS ITEM TO YOUR COLLECTION TODAY WITH OUR BUY-IT-NOW PRICE.